Summit Entertainment, Chop Shop and Atlantic Unveil "THE TWILIGHT SAGA: BREAKING DAWN - PART 2 - ORIGINAL MOTION PICTURE SOUNDTRACK"
NEW YORK, NY--(Marketwire - Oct 8, 2012) - Summit Entertainment, a LIONSGATE® company, Chop Shop Records and Atlantic Records have officially announced the release of "THE TWILIGHT SAGA: BREAKING DAWN - PART 2 - ORIGINAL MOTION PICTURE SOUNDTRACK," the musical companion to the highly anticipated final chapter in Summit's worldwide blockbuster film franchise. The soundtrack -- which was first revealed via Yahoo! -- arrives in stores and at all digital retailers on Tuesday, November 13th; the film release of THE TWILIGHT SAGA: BREAKING DAWN - PART 2 comes to theatres nationwide on Friday, November 16th. 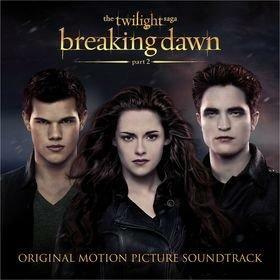 Pre-orders for "THE TWILIGHT SAGA: BREAKING DAWN - PART 2 - ORIGINAL MOTION PICTURE SOUNDTRACK" will begin on Tuesday, October 23rd. In addition to the soundtrack's electrifying lead single "The Forgotten," by Reprise recording group Green Day, "THE TWILIGHT SAGA: BREAKING DAWN - PART 2 - ORIGINAL MOTION PICTURE SOUNDTRACK" features new and exclusive material from an intriguing and irresistible line-up of artists, including Feist, Passion Pit, St. Vincent, and Reeve Carney (currently starring in the smash Broadway musical, Spider-Man: Turn Off The Dark). Among the soundtrack's innumerable highlights are "Bittersweet," performed by Ellie Goulding and produced by Sonny Moore, as well as "A Thousand Years (Part 2) feat. Steve Kazee," which sees Atlantic recording artist Christina Perri returning to her smash single, "A Thousand Years," first featured on 2011's "THE TWILIGHT SAGA: BREAKING DAWN - PART 1 - ORIGINAL MOTION PICTURE SOUNDTRACK." "THE TWILIGHT SAGA: BREAKING DAWN - PART 2 - ORIGINAL MOTION PICTURE SOUNDTRACK" also features "All I Ever Needed," the debut duet from American Idol's Paul McDonald and his real life wife, Nikki Reed -- a.k.a. THE TWILIGHT SAGA's "Rosalie Hale" (see tracklisting below). "When we were asked to be part of the 'Breaking Dawn - Part 2' soundtrack, we readily agreed because the films are an insane cultural phenomenon," says Green Day bassist Mike Dirnt. "We have always been impressed with the way the Twilight soundtracks are so carefully curated." "I am so honored and excited to be involved again in this final film and soundtrack," says singer/songwriter Christina Perri. "I'm also super happy 'A Thousand Years' is making a comeback, but it's not the same... you'll just have to wait and see how." Chop Shop Music Supervision owner Alexandra Patsavas (Grey's Anatomy, Gossip Girl) returns as Producer/Music Supervisor of "THE TWILIGHT SAGA: BREAKING DAWN - PART 2 - ORIGINAL MOTION PICTURE SOUNDTRACK," working closely with the film's director Bill Condon in compiling the tracklisting. Paul Katz of Eye2Ear Music serves as both a producer of the album as well as Summit's consultant for the movie's music and soundtracks. Released in November of 2008, "TWILIGHT - ORIGINAL MOTION PICTURE SOUNDTRACK" topped the Billboard 200 chart upon its release, marking the largest debut for an Atlantic Records soundtrack since Nielsen SoundScan began tracking sales in 1991. In addition, "THE TWILIGHT SAGA: NEW MOON - ORIGINAL MOTION PICTURE SOUNDTRACK" topped the Billboard 200 in its first full week at retail in October of 2009. Combined, all three soundtracks have sold nearly 9 million copies worldwide. The upcoming final chapter of THE TWILIGHT SAGA follows the 2011 release of THE TWILIGHT SAGA: BREAKING DAWN - PART 1. Academy Award® winner Bill Condon directed both films, which star Kristen Stewart, Robert Pattinson and Taylor Lautner. "THE TWILIGHT SAGA: BREAKING DAWN - PART 2," based on the fourth novel in author Stephenie Meyer's Twilight series, is written by Melissa Rosenberg, with Wyck Godfrey, Karen Rosenfelt and Stephenie Meyer producing. For more information, visit http://www.breakingdawn-themovie.com/. Atlantic Records celebrated its 60th Anniversary in 2008. Founded in New York City, the label literally grew from a one-room operation into one of the world's preeminent music companies. Atlantic has released a string of recordings that have had a profound impact on the course of modern music, its rich history including such musical icons as Ray Charles, Aretha Franklin, John Coltrane, and Led Zeppelin. The Atlantic roster today includes many of the world's most popular recording artists, among them James Blunt, B.o.B, Phil Collins, Death Cab for Cutie, Diggy, Missy Elliott, Flo Rida, Lupe Fiasco, Kid Rock, Bruno Mars, Matchbox Twenty, Janelle Monáe, Jason Mraz, Plies, Sean Paul, Shinedown, Rob Thomas, T.I., Trey Songz, Wiz Khalifa, Zac Brown Band, and many more. Alexandra Patsavas founded her own Chop Shop Music Supervision company in 1998. She quickly earned a reputation for raising the bar in the quality of music selected for television series and feature films including Grey's Anatomy, The Perks Of Being A Wallflower, Scandal, The O.C., Gossip Girl, Mad Men, Rescue Me, The Twilight Saga, Water for Elephants, The Dilemma, and the upcoming film Funsize. A champion of independent artists, Patsavas has been responsible for identifying and exposing a remarkable string of original music to mainstream audiences. In the process, she has played an influential role in the development of such artists as Death Cab for Cutie, The Killers, Snow Patrol, Modest Mouse, The Fray, Ingrid Michaelson, and many others. In 2007, Patsavas launched Chop Shop Records, which today is home to Milo Greene, Scars on 45, Anya Marina, The Republic Tigers, and the "TWILIGHT" soundtracks. "THE TWILIGHT SAGA: BREAKING DAWN - PART 2 - ORIGINAL MOTION PICTURE SOUNDTRACK"